Alabama is home to one of the richest and most diverse herpetofauna in the United States, especially in regards to turtle species. Not counting sea turtles, at least 22 species of chelonians reside in the Heart of Dixie. Three species - the black-nobbed "sawback" or map turtle (Graptemys nigrinoda), the flattened musk turtle (Sternotherus depressus) and the Alabama red-bellied turtle (Pseudemys alabamensis) - are endemic to the state. The Alabama red-bellied turtlehas the most limited distribution of the endemics. It's restricted to the rivers and swamps of coastal Alabama (near Mobile) and possibly adjoining southeastern Mississippi. It is one of the least-studied emydid turtles in North America. Until recently, little was known about its biology and ecology. Not until the 1990s, when it finally became apparent to both state and federal agencies that this species was not only endangered but rapidly heading toward extinction, did significant funding become available for in-depth research. Red-bellied turtle species are large: Adult females attain carapace lengths of 12 inches and weigh 2 to 4 pounds. Males are slightly smaller with carapaces around 10 inches. The skin and carapace are a dark olive green or brown. The carapace is oval, high doomed and usually has serrations toward the rear edge. The species is named for its usually reddish plastron, although there is considerable variability in this color, especially between the sexes and between adults and juveniles. The plastrons of female turtles tend to be duller and more yellowish, especially in older animals. This may be the result of abrasions from sandy soils acquired during nesting season. Male and juvenile red-bellied turtle species display the more intense red or reddish-orange coloration. Plastral markings in both sexes vary widely from plain to ornate dark bars or spots. Bars, spots and mottling on the plastron are most common in hatchling and juvenile turtles and least common in adult females. 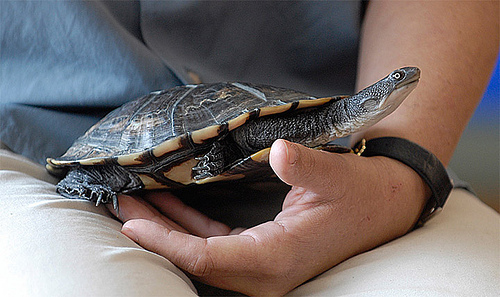 The Alabama red-bellied turtle exhibits a variety of other sexually dimorphic features, including longer front claws and more concave plastrons in the males. The toothlike notch or mandibular cusp, on the anterior of the upper jaw, is one of the more distinctive characteristics that distinguishes these turtles from others in the region. This feature is apparent in hatchlings and adults and tends to be more pronounced in males. The mandibular cusp and red plastron are obvious features of these turtles, but these are not sufficient to convince all scientists that Pseudemys alabamensis deserves full species status. The actual taxonomic status of P. alabamensis has been the subject of ongoing debate among herpetologists for years. Many believe it is just a a subspecies of the Florida red-belly turtle (P. nelsoni) or P. floridana (itself recently relegated to subspecies status - P. concina floridana - by Seidel, 1994). Others argue it is distinctive enough and isolated enough from Florida red-bellied turtle groups to warrant designation as a separate species. The argument is likely to continue until the respective DNA can be compared. The Alabama red-bellied turtle has the dubious distinction of being one of the most endangered turtle in the United States. It has been listed as endangered by the U.S. Fish and Wildlife Services since 1987. In recent years, the USFWS, the Alabama Division of Wildlife and Freshwater Fisheries, the Mobile District of the U.S. Army Corps of Engineers and the Mobile Bay National Estuary Program have funded research studies on behalf of the Alabama red-bellied turtle to better understand its basic biology, habitat requirements, distribution and estimated populations. Dr. James Dobie, a retired professor of zoology at Auburn University, studied this species for many years and was the first to identify the primary nesting site, population distribution and precipitous decline. Dobie's research provided the basic information used by the USFWS in designating the Alabama red-belly turtle as endangered. This research also provided the foundation upon which David Nelson, with the University of South Alabama, built his own work. From 1994 until 2000, Nelson and numerous graduate and undergraduate students conducted extensive research on red-bellied turtle movements, population and age structure, habitat and diets. The preferred habitat of the Alabama red-bellied turtle are shallow, backwater areas off of the main river channels and smaller bays adjacent to Mobile Bay. They are especially abundant in the area known locally as the "Delta." The Delta is a huge complex of largely undisturbed wetlands stretching from the northern edge of Mobile Bay to the convergence of the Alabama and Tombigbee rivers. This Alabama "Amazon" is comprised of over 250,000 acres of swamps, marshes, rivers and oxbow lakes. The majority of Alabama red-bellied turtles appear to be found around the Tensaw, Blakely and Apalachee rivers in the central part of the Delta and around the Causeway, an artificial land bridge that runs across the northern edge of Mobile Bay. These fresh and mildly brackish water environments provide an abundance of both submergent and emergent vegetation that turtles utilize for escape, cover and food. Nelson's studies indicate that red-bellies rarely venture into salt marshes, brackish waters (e.g., the lower portion of Mobile Bay) or small freshwater streams that are not adjacent to Mobile Bay. Apparently, these environments do not provide the dense associations of aquatic vegetation red-bellies prefer for feeding and hiding from predators. Nelson's radio telemetry studies of 44 Alabama red-bellied turtles documented that they move more extensively within their known geographic range than previously thought. Some animals moved more than 11 miles from where they were captured and outfitted with transmitters. Nelson's research has also documented a noticeable retraction of the Alabama red-belly turtle's earlier presumed range, at least in Alabama. Dobie found red-bellies as far north as Claude D. Kelly State Park, along the lower Alabama River. Extensive trapping by Nelson and his students in the lower Alabama River and northern Delta found virtually no Alabama red-bellied turtles and none were captured at the state park site. The majority of turtles captured by Nelson and his team were in southern Delta and northern Mobile Bay areas, including the Mobile, Tensaw, Apalachee and Blakely rivers. This species appears to be especially abundant around the Causeway, possibly because of the dense mats of floating and submerged vegetation present there. A few animals have been captured in the southern reaches of Mobile Bay and adjacent bays, but appear to be rare in these areas. Although this species' geographic distribution appears to have shrunk in Alabama, the discovery of a possible population in the Pascagoula River and the Back Bay of the Biloxi River in southeastern Mississippi provides some solace. For decades it's been assumed that Pseudemys alabamensis was endemic to the lower Mobile Bay drainage basin, and that it was primarily a freshwater turtle. If the turtles found in Mississippi do indeed represent another population of P. alabamensis, it would extend the range west by about 60 miles and into two new drainage basins. These animals primarily inhabit brackish water environments, unlike their Alabama counterparts, which prefer mostly freshwater habitats. Pseudemys alabamensis is a strict vegetarian. Stomach analyses have found that red-bellies feed almost exclusively on submerged aquatic vegetation, such as coontail (Ceratophyllum demersum), wild celery (Vallisineria americana) and hydrilla (Hydrilla verticillata). Hydrilla, an exotic plant that was introduced by the aquarium trade in the 1950s, seems to be especially favored by Alabama red-bellies. Nelson's research found hydrilla to be the single most prevalent plant in their diets, even in areas where other aquatic plants were more abundant. Nesting activity typically begins in April, and most nests are laid between May and August. The peak nesting period seems to be in June and July. The average incubation period is about 90 days, and hatchling usually takes place between September and November. Nelson confirmed that some eggs, probably those laid late in the nesting season, "overwinter" and hatch around March or April of the following year. Clutch size may be as large as 20 eggs but averages about 13. Pseudemys alabamensis appears to lay more than one clutch of eggs (double clutching) during nesting season. Females captured immediately after laying a clutch have been X-rayed and found to still contain eggs. Most Alabama red-bellied turtle habitat is affected by tidal influences. Nesting females typically select sites above the high-tide level, although nest sites occasionally flood during hurricanes and other periods of heavy rain. The most commonly used nesting areas appear to be spoils islands constructed from the sediment dredged from the ship channels in the Delta and Mobile Bay. Alabama red-bellies also appear to prefer nest sites that are at least partially vegetated. This may be to help disguise both nests and the movements of female turtles from possible predators. Nest predation appears to be higher in areas devoid of vegetation. Prior to Nelson's research, over 90 percent of all Alabama red-bellied turtle nest sites were believed to be on just one spoils island in the Tensaw River. Such a large concentration of the nest sites in one small area makes P. alabamensis very susceptible to a wide variety of nest predators, as well as natural disasters like storms and floods. Happily, Nelson found Alabama red-belly turtle nests on several other spoils islands as well. Nelson and Dobie both documented the incredible level of nest predation faced by red-bellied turtles. Systematic surveys by Nelson during a two year period failed to discover even one intact nest. Feral hogs, raccoons, fire ants, opossums and fish crows all prey on P. alabamensis eggs, resulting in an estimated nest loss of over 90 percent a year. Especially destructive are fish crows (Corvus ossifragus), which are known to watch female turtles lay and cover their eggs and then dig up the nests as soon as the turtles leave. If turtles manage to hatch, then they have to contend with the previously mentioned nest predators, plus alligators, large snapping turtles, large-mouth bass and alligator gar. Alligator populations have increased dramatically in the Delta in recent years. In high-density alligator areas, red-bellies are scarce or absent, either because the turtles avoid these areas or because they don't last long if they wander into them. Adult alligators are probably the only serious potential predators of adult red-bellies - alligator tooth scars on many carapace indicate indicate this. Human activities also exact a serious toll. Crab traps and boat props undoubtedly kill turtles, although no one really knows how many. But there is one area of human-induced mortality for which there is data: automobile-related deaths. Nowhere is this more evident than along the Causeway stretch of U.S. Highway 98. During 2001, Nelson conducted bicycle surveys of the Causeway to look for signs of road-killed turtles. He documented 70 dead Alabama red-bellied turtles between April and November. Ten were adult females (five were carrying eggs), one was a juvenile and 59 were hatchlings. This is a tremendous loss of animals. The State of Alabama has purchased Gravine Island and also owns Big Island and Meather State Park (on the Causeway), which protects much of P. alabamensis critical nesting habitat. The next step is to increase both nesting success and survivability. Dobie proposes controlling fish crows and feral hogs to reduce nest predation. Nelson used predator-excluder covers on a trial bases and gave at least 91 turtles a fighting chance to hatch. He proposes the wider use of excluders as part of a head-start program, similar to those uses in many areas for sea turtles. Nelson recommends installing a low fence along sections of the Causeway to prevent hatchlings and adults from wandering onto the highway. He also favors getting rid or rip-rap (large rocks used to control soil erosion along the lower Delta). Hatchlings often become trapped in spaces between the rocks. Although no captive-breeding program is currently in place, one may have to be instituted if other measures fail to bring this species back from the brink of extinction. In 1990, the Alabama Legislature bestowed upon the Alabama red-bellied turtle the auspicious title of State Reptile. This designation has done little to stop the red-belly's decline, but it has perhaps increased public awareness of its plight. Both federal and state agencies have funded research into the biology and ecology of this species, but much remains to be learned. Strides have been made, and there is now a better understanding of red-belly reproductive success (or lack thereof), movements, habitat preferences and food habits. But sound research awaits, as not enough is known about hatchling mortality, and the status and distribution of the Mississippi population needs to be addressed. Scientists and natural resource managers are faced with the daunting task of helping Pseudemys alabamensis numbers recover while increasing public awareness. Without decisive action, questions concerning the Alabama red-bellied turtle's taxonomic status, biology and ecology will be moot, as Alabama's state reptile becomes extinct. Turtles are one of the most appealing animals of the reptile kingdom. There are no "effort free" animals to keep as pets, and freshwater turtles are no exception. Along with the pleasure of owning a turtle comes the responsibility to provide the best possible care for it that you can. Their survival is in your hands! If basic guidelines are followed, then your turtle should thrive in captivity and may even breed for you. Freshwater turtles are renowned for their longevity and provided your pet remains healthy, may live thirty to seventy-five years in your care. This point should be taken into consideration before purchasing freshwater turtles to begin with. You may be choosing a friend for life! Most Australian freshwater turtles are very timid and shy, but within time will loose their fear and become accustomed to you and will recognise where their food comes from. There are many stories of keepers being amused while watching freshwater turtles in their aquatic enclosures, and some go as far to say that they each freshwater turtles have their own recognizable personalities. I believe that if more people keep our Australian freshwater turtles in captivity, then we can learn more from them and the better equipped we will be to help them. As pollution increases and swamplands are filled in for development, or rivers are dammed all in the name of progress, then we must make a concerted effort to monitor the effects that this is having on the population of our freshwater turtles. The world's most endangered turtle is the Western Swamp turtle whose numbers fell to around thirty in the 1980's. This species is currently undergoing a careful breeding program under turtle expert Gerald Kuchling and the Perth Zoo. Imagine how helpful it would have been if amateur herpetologists were already successfully breeding Western swamp turtles in captivity. Australia has some thirty described species and sub-species of freshwater turtle and four monotypic genera. They naturally occur in all states excluding Tasmania! There are possibly many undiscovered species of turtle that have eluded the watchful eye of herpetologists due to the elusiveness and subtlety of these fascinating creatures. The correct zoological classifications that apply to Australian freshwater turtles are Class - Reptilia, Order - Testudines, Sub-order - Pleurodire (all except the Pig-nosed turtle which is Cryptodire). Members of the sub-order - Pleurodire, or side-necked turtles, did not evolve until the Cretaceous Period -some 135 million years ago. Reptiles in this sub-order are closely linked by the fact that their bodies are encased in a hard shell, they curl their heads back into the shell by horizontal movement and their pelvic girdle (Ref. Fig 1) is joined to the shell. Turtles are sometimes described as "living fossils" and in many respects this term is correct. The main difference is based on physiology. Tortoises are terrestrial (land dwelling) and possess thick legs and toes and require water for drinking only. 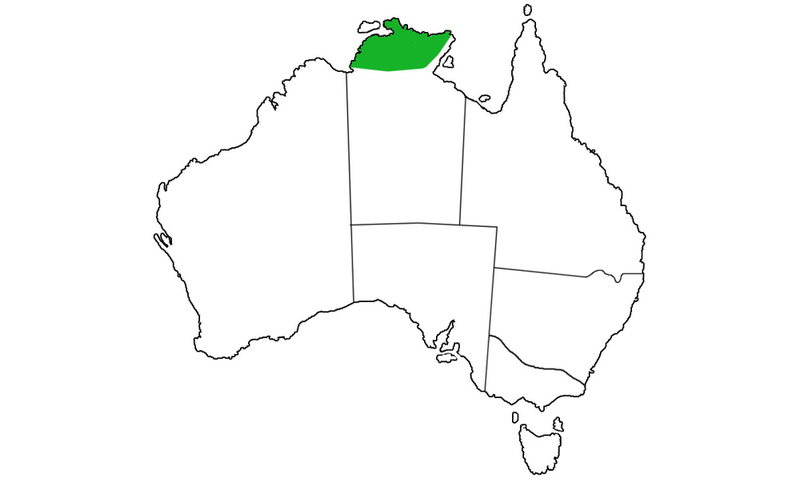 There are no tortoises indigenous to Australia. Freshwater turtles are aquatic and are not capable of swallowing food or mating unless submerged in water. They possess webbed feet or paddle-shaped, flipper-like limbs (as in the case of the Pig-nosed or Pitted-shelled turtle) and will only leave the water to lay eggs, bask in the sun or seek more favorable conditions in circumstances such as food shortage or drought. Freshwater turtles kept on dry land will dehydrate, starve, and die slowly and painfully. "Terrapin" is merely a synonym for "Turtle" and was derived from the North American Indian word "Terrapene". Turtles are sometimes incorrectly regarded as "cold-blooded" and cannot produce their own body heat, but instead regulate their body temperature by behavioural means - (Ectothemic). Surprisingly, their body temperature can be higher than that of their environment. On warm or hot days, turtles may leave the water and bask, usually stretching their hind legs out behind them to attain maximum surface area or maximum contact with a warm surface, and will retreat into the water to cool down. Turtles have also been observed floating near the surface in warm water currents with outstretched limbs. Here they are able to capture valuable U.V. and warmth, but with the added security of being submerged. One interesting personal observation has been a turtle's reluctance to sometimes dive back into the water after it has obviously reached its preferred temperature, and occasionally submerges its head and neck in an attempt to cool down. Other turtles sometimes appear to be "crying" and are releasing fluids via the eyes as part of cooling mechanism. Basking also aids in the control of skin complaints such as fungal infections, assists in shedding scutes and helps inhibit the growth of algae on the shell. Freshwater turtles are able to gain heat much quicker than they lose it. The colour of the carapace of a turtle also plays a role in thermo-regulation. A darker carapace will heat up more quickly than a tan or other light coloured turtle, and will be able to reach a higher temperature. Heat gained through basking and ambient temperature allows a turtle's metabolism to increase. 1. Pharyngeal respiration - where an extremely vascularised area at the back of the mouth will take oxygen out of the water. 2. Cloacal respiration - is achieved through thin walled sacs in the cloaca, also absorbing oxygen from the water. 3. Oxygen absorption through the skin. It is important to note that most species cannot survive under the water for more than 2-3 hours when not in a state of dormancy. Aestivation is when a turtle buries itself in the mud at the bottom of its waterhole or drinks as much water as it can then leaves the water and buries itself under dirt and foliage to escape drought conditions, or dangerously low levels of water. During this time, a turtle also enters a state of dormancy and slows its body processes down. Here it will remain until the water levels are restored or will perish in the event of an extended drought. All modern turtles lack teeth. Short-necked turtles use the tough edges of their jaws to tear and dismember food. Here the clawed forelimbs also serve a useful purpose by tearing excess food away while it is firmly clamped by the mouth. Long necked turtles are essentially ambush feeders. They strike with their mouths open, drawing in large quantities of water containing their prey. Food intake of all turtles is subject to availability, and the size and age of each individual. Food intake is also temperature dependent, with most turtles ceasing to feed below 15 deg.C. Temperature also plays an important role in the time food takes to pass through the digestive system. For this reason, it is not recommended to offer food to your turtles for several weeks prior to brumation, as the food may rot in the gut and cause death. Food normally takes around 1 to 2 weeks to be completely digested. At the end of the intestinal tract is the Cloaca (Ref. Fig 2) which is where faecal and urinary waste collects and is passed. Both the male and female genital openings are also located in the cloaca. Food digested that is considered excess to the turtles growth and energy requirements is turned into fat and stored in the abdomen, rather than beneath the skin as in the case of mammals. This may be because fat stored beneath the skin could act as insulation and effect thermo-regulation. A turtle's shell is divided into two sections. The lower section is the Plastron and the upper section is the Carapace (Ref. Fig 1). The two sections are joined together by the Bridges that are located either side of the body, between the fore and hind limbs. The strength of the shell comes from the fused plates (Ref. Fig 1), which are covered by shields called scutes, lamina or scales (Ref. Figures 1+3). These shields are made from Keratin that is produced by the Malpighian cells; located just under the scutes. Freshwater turtles have heart (Ref. Fig 2) with only three chambers. Many things including increased activity, temperature and increased pressure during diving affect their heart rate. 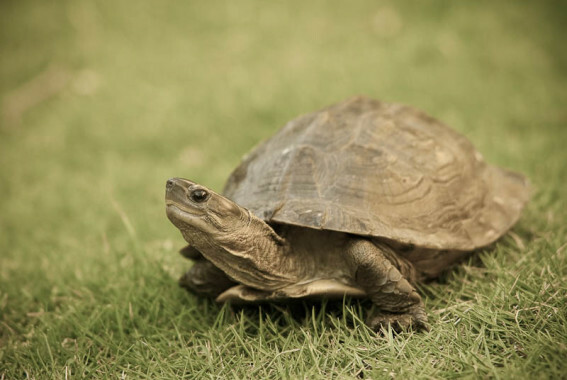 An increase in ambient temperature will cause an increase in heart rate, thus increasing a turtle's metabolism. As a turtle dive, pulmonary resistance increases and the heart rate decreases. The scientific name for this is "Bradycardia". When a turtle dives, the level of oxygen in the blood decreases as the body uses it. Anaerobic metabolism takes over causing an increase in carbon dioxide. Most aquatic turtles can tolerate extremely high levels of carbon dioxide in the blood. After about 15 minutes of being submerged and the oxygen supply depleted, the brain will divert as previously mentioned, to anaerobic metabolism. Here the brain can continue to function effectively for around 2-3 hours depending on the species and size of the individual. Unlike the lungs of mammals, a turtle's lungs (Ref. Fig 2) are not maintained at positive pressure. The ribs of a turtle are joined to the shell (Ref. Fig 1). Breathing is performed with help of muscles that are located near the limbs at four corners of the shell. These muscles create a negative pressure in the lungs and respiration takes place. Inspiration occurs due to the difference in pressure. Expiration, however, does take some degree of effort. When a turtle enters the water this situation is completely reversed due to the increase in water pressure. Inspiration now requires muscular activity, and expiration is aided by the water pressure and takes little or no effort. The amount of air in the lungs and the transferral of fluids within the bladder and cloaca control a turtle's buoyancy. Proof that the lungs help control a turtle's buoyancy is clear when watching a turtle with a respiratory infection. turtles suffering from respiratory infection cannot dive and have been observed floating at unusual angles (pers. obs). A turtle's senses of vision, smell and hearing are highly developed which is necessary for locating food, avoiding predators and important in finding suitable mates during breeding season. It has been suggested that they possess colour vision and this may be why some turtles show colour preferences when feeding. All freshwater turtles have a thin, transparent third-eyelid, called a nictitating membrane that covers their eye while they are submerged to allow them to see proficiently under water. Their sense of smell is achieved through the nose and also through a specialise structure called Jacobsen's organ. Jacobsen's organ is located in the roof of the mouth. Its function is to detect and identify tiny chemical, scent particles that are floating around in the air and water. The scent particles are moved around the mouth and throat by "gular pumping" (throat movements similar to that of frogs.) We have observed many species of freshwater turtles' gular pumping while submerged. Turtles do not have external ear opening instead they have a tympanum (eardrum) that is covered with skin. The inner ear is surrounded by a bony box-like structure known as the otic capsule. Turtle's hearing is at its best detecting low-frequency vibrations under water and to lesser extent, on land. Their ability to hear medium to high frequency sounds is difficult to determine. All Australian turtles have four scent glands, one on either side of each bridge, near the limb pockets (Refer arrows on Fig.3). The odour produced is used as a defence mechanism against predators, and possibly with other males when they feel threatened while competing for the same female during breeding season. It is recommended to keep small turtles up to seven centimetres shell length indoors where they can be easily monitored. A 3-foot or 4-foot long aquarium is recommended. the aquarium should have 3-4 centimetres of river gravel and be a half to two-thirds full of water. The aquarium should also contain a log that protrudes above the surface of the water, or an artificial platform, so the turtles may leave the water to bask and dry out. Choose a log that has been collected from a creek or steam as dry timber will float and discolour the water. There are some commercially available floating islands like the Zoo-Med "Turtle dock"or the Herp Craft "Floating Land" products that are inexpensive and highly recommended. The "basking areas" should be situated directly below the sides of the aquarium where the glass lids can be removed. A decade ago or more, except for a handful of pioneering enthusiasts, genuine breeders were virtually non-existent. Their patience, improved husbandry techniques and record keeping has paid off. Many of the commonly encountered problems are rarely seen today, and captive breeding is a regular event on the calendar. Today we are able to enjoy the determination and achievements of past and present enthusiasts, with freshwater turtles being one of the more commonly encountered reptiles maintained in private collections throughout Australia. Given a few simple requirements, freshwater turtles are easy to maintain in captivity and require less time and space than other animals such as cats and dogs. Because turtles are less demanding than other companion animals, parents find them a great learning tool for children. Kids love turtles, and the responsibility of owning a turtle prepares them for life’s greater responsibilities. This beginners guide should answer many of the common questions asked by novices, and thus improve husbandry standards for keeping turtles. This guide should not replace a good book on keeping turtles, or be a substitute for advice from experienced turtle enthusiasts and veterinarians. We all have our own techniques, however the basics are very similar. This guide is based on 25 years of intensive turtle husbandry and research by the author. Outdoor ponds provide turtles with access to natural sunlight and foods that may wander into the enclosure. An outdoor enclosure also gives the turtle more space than can generally be provided in an indoor enclosure. The strongest type of pond, and most permanent, is the concrete pond. Alternatively pre-made fibreglass or plastic come in a range of sizes, shapes and prices. These can be buried to ground level. Ponds should be a minimum of 500mm deep to reduce overheating in summer or freezing in winter, and as large as possible. The pond should be constructed in such a way that the turtle can easily get out of the water and bask on the surrounding land area. 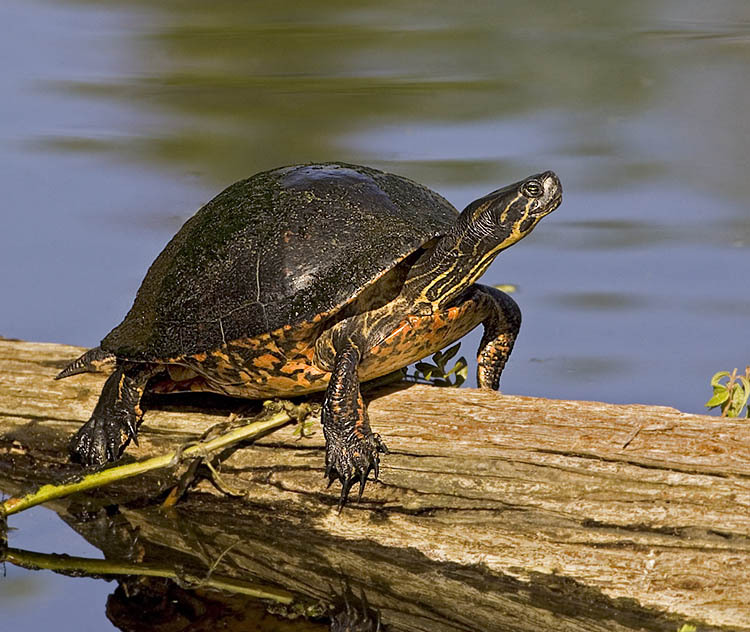 A plank may be beneficial for the turtles to bask on, or act as a ramp out of the water. The turtles should have access to both sunlight and shade at any time of the day. Enclosure walls are typically made from corrugated iron, tin, cement sheet, smooth walled brick, or wire netting, with a wire mesh roof. This obviously prevents your turtle from escaping, but also keeps unwanted predatory animals out. Ensure that rocks, logs, branches, grasses and small shrubs are not used as a ladder to escape over the walls, as most turtles are good climbers despite their somewhat cumbersome appearance. Glass aquariums are one of the most common enclosures in which to house turtles indoors. They should be of adequate size so that overcrowding does not occur, ensuring that individuals don’t bump into each other as they swim. As an alternative, fibreglass or plastic containers of an appropriate size, also make good enclosures. Farm feeder troughs are ideal as they are much larger than the smaller tubs found in some stores. If you use decorations, like rocks or timber, be sure that the turtle cannot dislodge the furnishings or wedge itself, which may result in drowning. A land area such as a platform or similar shelf must also be provided for the turtle to leave the water and bask, and thereby dry itself completely. The size of the platform depends on the turtle and as a general rule all the turtles in the enclosure should be able to sit comfortably on the platform. The platform may be siliconed or sat in position, then covered with carpet grass for a more natural appearance, a small ramp may also be fastened in place with silicone to make an exit from the water much easier for the turtle. Carpet grass, or some other type of plastic mat, may extend down the ramp, alternatively, beads of silicone may be used as a ladder for turtles to exit the water. An advantage of the shelf is that turtles can swim underneath, thus maximising the amount of space in an aquarium/tub. Turtles that are maintained indoors will need an artificial light and heat source to provide a day/night cycle. One cannot underestimate the importance in quality of light for turtles, especially those which are housed indoors. Lighting which is specially manufactured for reptiles is generally termed full spectrum lighting and provides reptiles with beneficial light waves, similar to that of the sun. The lights should not be too high in UV output as this can be detrimental to the turtle’s health, such as burning the eyes. A light bulb over the land platform will help raise the air temperature and when placed above the land area it doubles as a basking light which helps stimulate natural behaviour patterns. The water temperature should be maintained between 22 to 28oC, with the air temperature a few degrees higher, depending on the species. The temperature can be dropped a few degrees over winter. When it comes to water quality, whether it be a pond or an aquarium, the primary concern for most turtle keepers is keeping the water clean, odourless and clear. This may be done using a good filtration system, weekly water changes and regular monitoring of water quality. If the water is unable to support fish then it is also unsatisfactory for turtles, therefore, the basic aquarium principles that apply to keeping fish are relevant to keeping turtles. This means monitoring pH, hardness, ammonia, nitrates and keeping the water oxygenated. Turtles tend to produce more waste material than other aquatic animals such as fish, so regular water changes will be needed. The water will also need to have a good quality filtration system, one that can handle the damage incurred by turtles. The amount of food offered to turtles can be difficult to judge, as most are opportunistic feeders and will gorge themselves in anticipation of the lean times ahead. Turtles should not be over fed as this may lead to obesity or other diet related disorders. Most turtles often swim frantically towards you when you walk into the room, this is often interpreted as the turtle begging for food or being hungry, and as tempting as it may be, do not offer food unless it is feeding time. Feeding time should be done two to three times a week, depending on how active your turtle is. As a guide, offer the turtle a portion of food about the size of its head at each feeding. The best foods to offer turtles should consist of plant material such as algae, Vallisneria, Elodea, water cress, duckweed, alfalfa, swiss chard, non-fibrous greens, celery tops, cabbage, spinach, kale, lettuce (darkly coloured), squash, tomato, sweetpotato, pumpkin, zucchini, corn, dried (dehydrated) or fresh fruits (eg. figs, melons, apples, peaches). Likewise, turtles will readily eat beetles, bugs, crickets, daphnia, dragonflies, earwigs, fish, flies, grasshoppers, mice, moths, mussels, nymphs and larvae, shrimps, slaters, snails, spiders, water boatmen, worms, yabbies, non-fatty meats and organ meats (eg. chicken or ox heart and liver), tinned dog or cat foods, dry dog or cat food (soaked or un-soaked), fish flakes, trout pellets, yabby pellets and commercial reptile foods. It will be necessary to supplement foods like meat with vitamins and minerals, particularly for turtles kept indoors. Multivitamins can be sprinkled over, or packed into the food and are available pre-packed (eg. ZooMed Reptivite®, Herptivite®, Nekton-Rep®). Varying the diet as much as possible will help to provide a broader range of vitamins and minerals to your turtle and reduce the risk of nutritional disorders. The majority of ailments and disorders affecting captive turtles usually result from improper husbandry. Some examples include insufficient heat and light, being fed in cold conditions, dirty enclosures and putrefied water (eg. faeces, rotten food, etc), contact with other sick animals, and injuries. Early stages of ailments can be determined by careful observation. If your turtle is routinely inspected then you will recognise changes from normal behaviour. Treatment needs to be provided as soon as a problem is noticed, before it becomes too advanced. As with any ailment or disorder, a veterinarian should always be consulted for positive identification. An experienced reptile veterinarian will usually discuss your husbandry before embarking on any course of treatment, especially with keeping turtles. The bright red underside of this turtle gives it its common name. This colour fades as the animal grows, but still remains in adults as a reddish tinge. In Australia, painted turtles are found only in the Jardine River system at the top of the Cape York Peninsula. Because of this extremely limited distribution, the painted turtle is classed as rare in Australia. They are, however, widespread in Papua New Guinea. The painted turtle can be found in clear rivers, lakes and lagoons, where they inhabit areas with abundant aquatic vegetation and natural basking sites with both gravel and sandy bottoms. As with all freshwater turtles, painted turtles spend most of their time in the water, coming out occasionally to bask in the sun or, in the case of females, to lay eggs on a river bank. Their diet includes fish, aquatic insects, water snails and greenery. The bright red underside of this turtle gives it its common name. This colour fades as the animal grows, but still remains in adults as a reddish tinge. As with all freshwater turtles, the painted turtle spends most of their time in the water, coming out occasionally to bask in the sun or, in the case of females, to lay eggs on a river bank. In Australia, painted turtles are found only in the Jardine River system at the top of the Cape York Peninsula. Painted turtles are classed as rare in Australia; they are, however, widespread in Papua New Guinea. This distinctive species of freshwater turtle was only described by scientists in 1994 from the Mary River in the hinterland north of the Brisbane region. As a fully grown adult it is probably our largest freshwater turtle, making it even more intriguing that it escaped notice by scientists for so long. The species was in fact known from hatchlings, which were sold in pet shops as 'penny turtles'. It was through this that the Mary River Turtle species came to the attention of Sydney turtle researcher John Cann. During a period spanning more than 20 years he tried to trace the source of the baby turtles that were being sent to the pet shops. After many unsuccessful attempts he finally located the source, which was a property on the Mary River. John described the turtle with an American researcher in 1994. Like his previous discovery, the Fitzroy River turtle, the turtle from the Mary River is equally strange in its biology. Both species share a mode of 'cloacal breathing' where oxygen is taken in through the surface of the cloaca. It also is recognized as one of the most threatened species of freshwater turtle in eastern Australia. 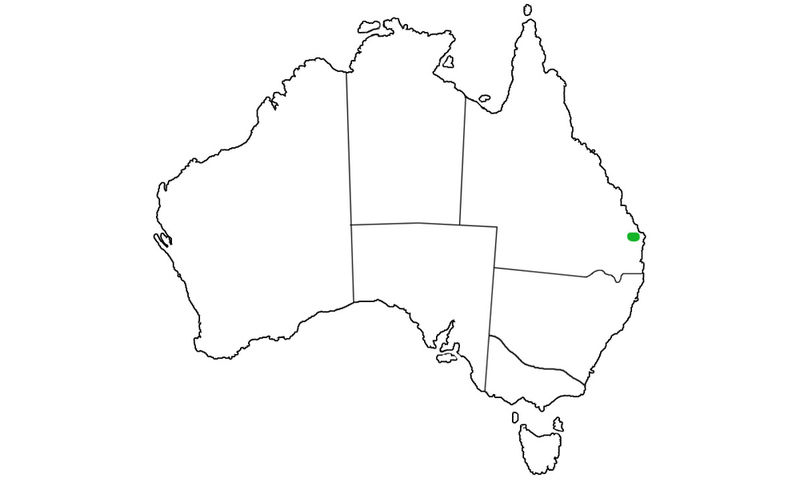 The Mary River Turtle was only described by scientists in 1994 from the Mary River in the hinterland north of the Brisbane region. The Mary River Turtle species were sold in pet shops as 'penny turtles'. It was through these that the species came to the attention of Sydney turtle researcher John Cann. It took John more than 20 years to trace the baby turtles to the Mary River. Mary river turtles are recognized as one of the most threatened species of freshwater turtle in Australia. Despite this, the Queensland government is planning on damming the Mary River at for the Traveston Crossing dam project. This dam will have untold consequences for the many rare species found in the Mary River, including this turtle.